This good intermediate level 16 inch viola for sale was made in a German shop for the Chicago based William Lewis and Son company. It was made in 1994 and labeled "Rappoldi". 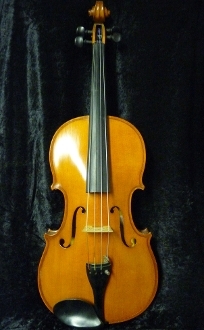 The 16" Rappoldi Viola has a good reputation for being an upgraded instrument; it has improved wood and craftsmanship over an entry-level student viola. This particular Rappoldi is in excellent condition; despite it's use, there are no signs of wear or repairs to this viola. The instrument's big and deep tone is easy to pull from the strings. Priced at $1700.00, an advancing violist would be well served by playing on this viola.